GraphQL is a new concept devised by Facebook to design Web APIs. It is billed to be an alternative to widely used REST APIs. 3. Predictable results : Send a GraphQL query to your API and get exactly what you need, nothing more and nothing less. GraphQL queries always return predictable results. 4. Unlike REST (where we have a end points per resource), application using graphQL exposes a single endpoint. Since GraphQL APIs are organized in terms of types and fields and not endpoints, it provides far more flexibility than traditional REST API. 5. GraphQL queries handle not just the attribute of one source but also simply follow source between them. GraphQL enables us to fetch data from nested data set in a single request (Eg: Get All Posts + latest comments associated with each post). This is achieved in REST, by calling multiple endpoints (1 endpoint to fetch posts + 1 endpoint to fetch comments from each post. This leaves us with hazardous n+1 fetching problem). Before we dive further into GraphQL, let's discuss REST and the problems with it which GraphQL attempts to solve. The Representational State Transfer (REST) architecture is the most popular way to expose server data over web. In the RESTful architectural style, servers only offer resources. Resources are conceptual things about which clients and servers communicate (Eg User, ShoppingItem, Reviews, ShoppingCart are common resources in a typical shopping portal application). Each resource is identified by a URL. REST uses standard HTTP verbs are used to perform actions on resources. In RestFul API, resources can be represented in number of formats. Popular formats being Json, XML, RSS. Under and Over Fetching data : In RESTful API, client has no control on the amount of data server sends for a resource, it can only ask for the resource to server. GraphQL solves this issue, as control rests with API client as what data it actually needs from server. It asks for specific fields and server happily obliges. At the heart of any GraphQL implementation is graphQL schema, which is typically description of types of objects, relationships between them and further operations permitted on them (queries and mutations). Queries are commonly sent over HTTP to a specific server endpoint (unlike a REST architecture, where there are various endpoints for different solutions). Type ‘Mutation’ is typically used to modify the server side resources. 1. In our application the core entities are Article and Feedback. An article is similar to a user post and feedback are the replies/comments on it. Thus an article has many feedbacks. 2. Basic operations are get articles, feedbacks for an article, create article and create a feedback. 3. We are using MongoDb as the persistence layer for our application. 4. We will be using Spring boot starter for graphQL java implementation. 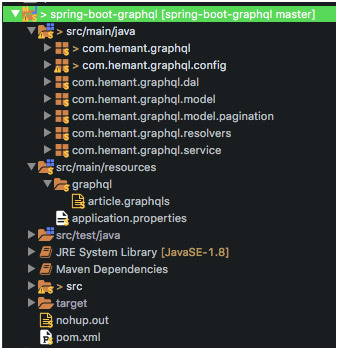 We will be creating a spring-boot maven project. As explained earlier, we have 2 model classes : Article and Feedback. An article can have multiple feedbacks (thus 1: many) relationship between them. In addition to it, we have also defined an enum for SortOrder. We have devised our graphQL schema complimenting our models. 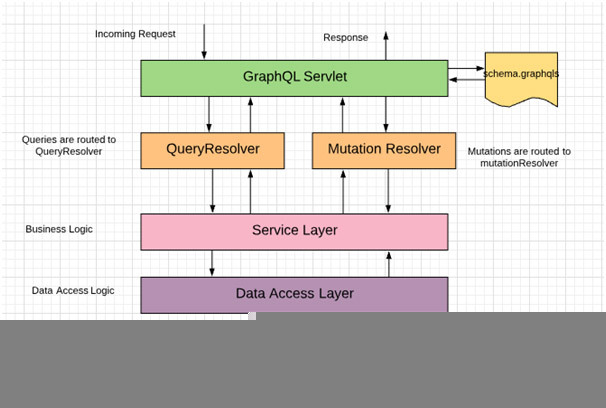 Also in schema we have defined the graphQL query and mutations. The schema is defined as article.graphqls file in src/main/resources folder. Spring boot gets its properties from default application.properties file in src/main/resources directory. For all the queries defined in `Query` type in article.graphqls file, this class will provide its implementation. For all the mutations defined in `Mutation` type in article.graphqls file, this class provides its implementation. This layer defines the business rules/logic. This layer defines the interaction with database ieMongoDB. The final piece of puzzle is main class for spring boot. a. Go to root directory, execute “mvn clean install”. This will create the jar in /target child directory. 3. Once the application is started, its endpoints can be called. 4. Once application is started, you can go to “ http://localhost:8080/graphiql” in your browser. This will launch graphiql - an electron application to test our graphQL endpoints. This comes with content-assist, auto-complete for building quick building of queries and mutations. 3.2.1 Let’s start by creating a few Articles. Here we have asked only id, name, createdByUserId and createdOn attributes. As predicted, we only got id, name and createdOn for each article fetched. 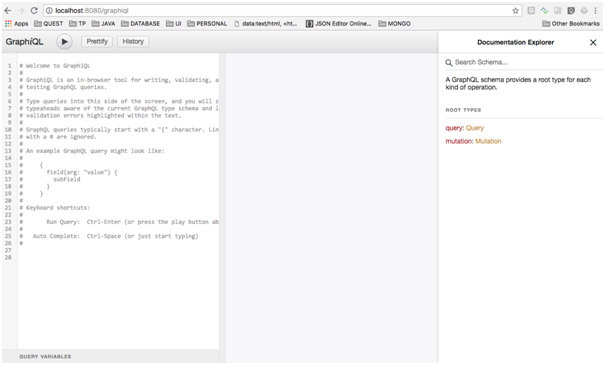 Thus we have tested the graphQL application and its end-points using graphIQL interface. We have queried the graphQL schema, using query and verified that it returns only those attributes which client explicitly asks in API. We also performed server changes, using mutations. Again we verified that it returns only those attributes which client explicitly asks in API. This is quite a different API building experience than typical REST APIs.